Michal Allaire joined Pacific Science Center in 2009, as the Chief Financial and Operating Officer. Michal’s most recent experience was at KCTS Television where she was Vice President and Chief Financial Officer since 2004. There, her responsibilities included finance, technology, legal affairs, business management, human resources, facilities, web and development, as well as fundraising activities, major giving, planned giving, membership, direct marketing and television pledge. Michal’s strength is her wide-ranging experience which also includes formerly serving as Vice President of Finance and Property for Child and Family Service. In addition, she was Director of Finance for Southwest Counseling and Development, a mental health and homeless provider in Detroit, Michigan. She also served as Customer Services Director for the American Association of Critical-Care Nurses where she published two magazines, held national educational conferences, and administered professional certifications in Aliso Viejo, California. Also, as an adjunct professor at Hawaii Pacific University in Honolulu, Michal taught Accounting for Governmental and Nonprofit Entities and Principles of Accounting to both financial and non-financial professionals. Michal is a graduate of the University of Washington and earned her MBA at National University in Irvine, California. Experience Pompeii before and after the epic eruption 2,000 years ago. Imagine the moment their world vanished and discover the miraculous artifacts unearthed since. Witness the final moments of those entombed in ash – including the largest collection of body casts ever presented. In the year 79, Pompeii vanished beneath thick layers of volcanic ash left by the eruption of Mount Vesuvius. But what nature destroyed, it also preserved! 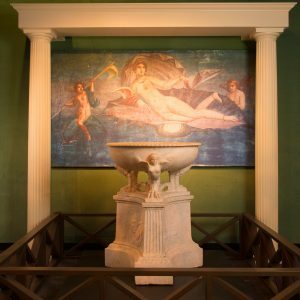 POMPEII: The Exhibition tells the tale of this city, hidden from view and forgotten for centuries until its rediscovery over 250 years ago. From garden frescoes and marble statues to helmets and shin guards of the day’s Gladiators, coins and currency to religious altars and shrines — all set in their original surroundings — you will experience daily life in this bustling Roman city. The exhibit also includes the largest collection of body casts on display to the public. Here is more information on the Pacific Science Center website. POMPEII: The Exhibition opens to the public on February 7 and will be on display for the final time in the U.S. until May 25. Today Michal will narrate a visual presentation and stories behind how the exhibit was created, where it has traveled and what you can expect to see. This is a fantastic opportunity for BBRC members and their guests to get an advanced preview of the exhibit, learn about the rich culture and history of Pompeii, as well as the science of volcanoes, earthquakes and natural disasters that are highlighted and how it relates to our region. It is also an opportunity to learn about the community partnerships and support for the exhibit and some of the exciting programming that is happening along with the exhibit. The presentation will include an overview of the exhibit, the parallels of our regions volcanoes and Mount Vesuvius and the exciting partnerships formed to educate our community on disaster preparedness.